The Seth Cole Tracing Paper Pad (50-Sheet) is a versatile and useful parchment designed for a variety of drawing and drafting applications. Each pad contains 50 sheets of 25-pound professional-quality tracing paper with finely textured surface. With its high transparency and excellent erasing qualities, this tracing paper is ideal for transfer, tracing, layout, sketching, and overlay work. It provides sharp diazo prints. For additional functionality, the Seth Cole Tracing Paper Pad (50-Sheet) is compatible with large document copier to accommodate various printing needs. It comes in a wide array of sizes including 9"W x 12"L, 11"W x 14"L, 14"W x 17"L, and 19"W x 24"L to suit different drawing preferences. 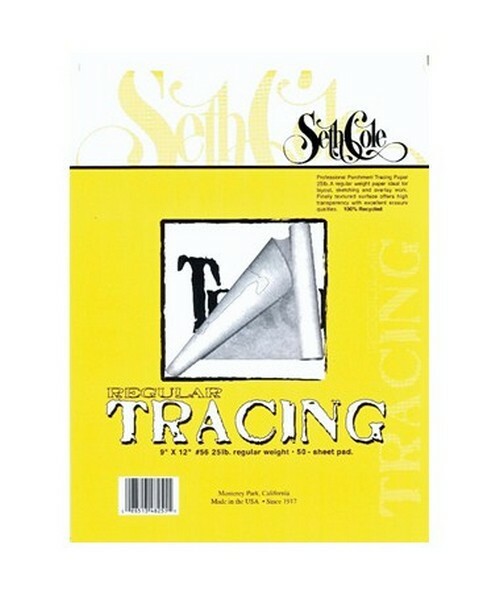 The Seth Cole Tracing Paper Pad (50-Sheet) comes in four different sizes. Please select your preference from the drop-down menu above.